Little Carrot Patches. 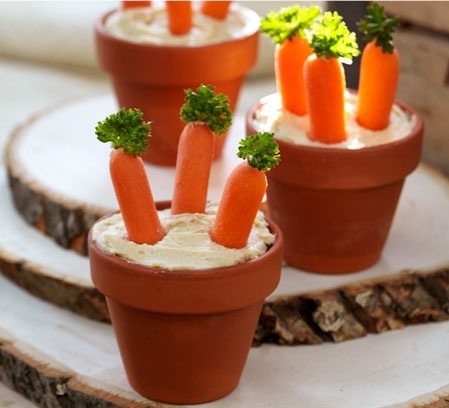 Why not make a cute little presentation for your kids lunch or dinner with a healthy Easter treat. 1.) Spoon 3 tablespoons of hummus into a small plastic cup (ours were 3-ounce size). 2.) Shortly before you’re about to serve, gather three to four baby carrots for each cup and use a toothpick to poke a hole in the top of each one. Insert a sprig of parsley into each hole. 3.) Then plant the carrots in the hummus. Place the cups in mini terra-cotta pots. Hi! I’m writing an article for my blog about healthy alternatives for Easter. Would you mind if I use your picture and feature you in the post.